I’ve had this recipe for more than ten years and have made this salad more times than I can count. Written on a well worn recipe card, “Beth Welden’s Salad” is the recipe of a long ago friend and Birmingham gal with whom I went to church years ago. As I recall, this recipe did appear in a Homewood Church of Christ cookbook (where Beth and I were once members); however, I’ve lost my copy and only have my notecard version. This salad is a huge hit whenever it is served. I’ve never found anything similar – online or in cookbooks, so it is a guaranteed crowd pleaser that most guests will have never tasted before. The dressing is outstanding and has a taste like none I’ve ever had. It is sweet, tangy, and complex. 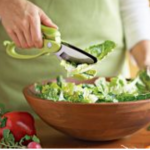 Its thickness makes it best for salads with hearty lettuces and ingredients that don’t easily wilt. Try this salad; I promise you, you’ll be surprised at how yummy it is! With holidays approaching, this is the perfect time to wow guests with something new and delicious. Let me hear from you if you try it; I’d love to know what you think! Cook’s Note: One thing that cannot be overemphasized with any salad is to be conservative with the dressing; nothing ruins a good salad faster than drowning it in dressing. Add small amounts at a time, and toss, toss, toss! Mix all salad ingredients. Toss with small amounts of dressing just before serving. Chop and dice all ingredients so that they are uniform. Layer salad, tomatoes, cucumbers, onion, pepper, olives, mushrooms. Top with walnuts, bacon and cheese. Add avocados just before serving. Pour small amounts of dressing, approximately 1/2 cup to start, and toss well. Taste before adding more. Dressing will keep up to two weeks in the fridge but needs to sit at room temp before serving.